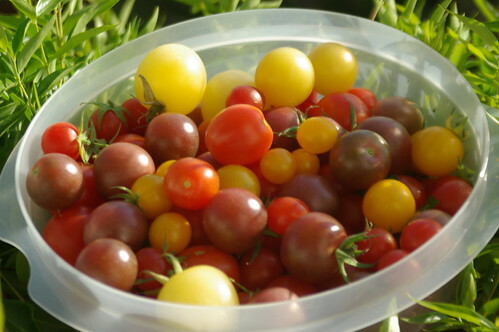 Here's a pile of cherry tomatoes from the garden -- all varieties are represented here, including the volunteer cherry tomatoes (they are the biggest round tomatoes). DRYING UPDATE: the Principe Borghese tomatoes are doing alright, but drying unevenly. The pears are crispy. They are brown. Not pretty.